As professor, pastor, and president, Christ has always been at the center of Dean Orrin Wenthe’s confession and practice. His clarity of thought and charity of heart has encouraged and in­spired his parishioners, colleagues, and, especially, students entering the pastoral min­istry in coming to a deeper understanding of their Lord Christ. 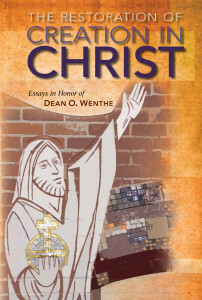 Written in honor of Dr. Wenthe’s forty years of service to Concordia Theological Seminary (Fort Wayne, Indiana), the essays in The Restoration of Creation in Christ illuminate the central accents of his teaching as a biblical theologian about the sacramentality of God’s good creation and how God uses the “stuff” of this world to deliver to us promises that are concrete, real, and even infinite. Dr. Wenthe will be signing copies of this book at the Fort Wayne Symposia, Wednesday, January 22, at noon outside the bookstore. The volume includes essays by Robert V. Roethemeyer (“Everlasting Son of the Father”), Lawrence R. Rast Jr. (“Founding a Seminary in the Wilderness”), William C. Weinrich (“On the Holy Pascha”), Christopher W. Mitchell ([How] Should Lutherans Read the Old Testament?”), John W. Kleinig (“The Mystery of Christ and Cosmic Restoration”), Daniel L. Gard (“The Supposed Problem of a ‘River of Blood’”), Peter J. Scaer (“Cloudy Skies and Clouded Eyes”), Charles A. Gieschen (“The Son as Creator and Source of New Creation in Colossians”), Arthur A. Just Jr. (“The Eyewitness of the Other Son of Zebedee”), Walter Obare Omwanza (“Revelation of God in Christ”), Matthew C. Harrison with Roland F. Ziegler (translation of “Werner Elert: The Visitation Office in the Church’s Reorganization”), David P. Scaer (“Christian Involvement in the Public Square”), Paul J. Grime (“The Psalter in Christian Worship”), John T. Pless (“Bonhoeffer on Psalm 119”), Timothy C. J. Quill (“The Liturgical Hymnody of St. Ambrose of Milan”), James G. Bushur (“Woman in the Image of God”), Scott R. Murray (“The Beauty of Holiness”), and Thomas J. Egger (“Jesus: The Second and Greater Adam”). The following condensed version of the biography of Dr. Wenthe celebrates his numerous contributions to the LCMS and to the entire body of believers who await the restoration of creation in Christ. Dean Orrin Wenthe was born in the modest central Illinois town of Effingham just before the twentieth century reached its halfway point. Located today at the intersection of Interstates 57 and 70, Effingham has always been a “crossroads.” At the time of Dr. Wenthe’s birth, the Pennsylvania and Illinois Central railroads crossed paths in Effingham. Today, Effingham is best known for the “Cross at the Crossroads,” a 198-foot tall cross that dominates the short stretch of road where the two interstates join together. Dean Wenthe has always maintained “the Christological crossing” as the center of the biblical witness and heart of the Christian faith. As professor, pastor, and president, Christ has always been at the center of Dean Wenthe’s confession and practice. Whether he would pursue pastoral service as his life’s vocation, however, was not a certainty. As he approached graduation from Effingham High School in 1962, Dr. Wenthe explored the possibility of studying physics at the University of Illinois. Instead, Christ led him toward the pastoral ministry. He prepared for the Office of the Ministry at Concordia College, Milwaukee (Associate of Arts, 1965), Concordia Senior College, Fort Wayne (Bachelor of Arts, 1967), and Concordia Seminary, St. Louis (Master of Divinity, 1971). He received his Master of Theology (Th.M.) at Princeton Theological Seminary (1975), and a Master of Arts (M.A. 1985) and Doctor of Philosophy (Ph.D. 1991) from the University of Notre Dame. Just prior to his vicarage, on July 26, 1969, Dr. Wenthe married Linda Arnholt. They have been blessed with four sons, Timothy, Matthew, Joel, and Joshua, three daughters-in-law, and eight grand­children. After his seminary graduation, Dr. Wenthe was called to Con­cordia Theological Seminary in Springfield, Illinois, first as Instructor (1971–1973) and then as Assistant Professor (1973–1977). While in Springfield he served as a chaplain in the Air Force Reserves. In 1977 he accepted a call to Zion Lutheran Church in Atlantic, Iowa, where he served as pastor for three years. He returned to the seminary (now in Fort Wayne) as Associate Professor of Old Testament in 1980, and in 1992 he was elevated in rank to Full Professor. While teaching at the seminary, he served pastoral vacancies at Emmanuel Lutheran Church in Wayne Trace (Soest), Indiana, and Zion Lutheran Church in Garrett, Indiana. From 1989 to 1996 he was pastoral assistant at Emanuel Lutheran Church in New Haven, Indiana. . . .
His service to the church-at-large has been rich and varied. He has served for various lengths of time on the Exegetical Subcommittee of the Church Literature Commission (1972–1978), the Commission on Ministerial Growth and Support, and the Commission on the Sanctity of Life; as an advisory member of the Commission on Theology and Church Relations (1996–2010), the Board for Mission Services (1996–2010), and the Boards for Higher and Pastoral Education (1996–2010); as a guest instructor at Concordia Seminary, St. Louis in 1974, 1978, 1979, and 1992; and as an LCMS representative to the Lutheran/ Catholic dialogues. He has delivered papers at numerous conferences and written articles for a variety of theological journals. He served as an associate editor of the Concordia Self-Study Bible and is currently the General Editor of Concordia Com­mentary: A Theological Exposition of Sacred Scripture, published by Concor­dia Publishing House, for which he is also writing the commentary on Jeremiah. In 2009 he edited the volume on Jeremiah/Lamentations in the Ancient Christian Commentary on Scripture (InterVarsity Press). Dean Wenthe was called as the fifteenth president of Concordia Theological Seminary on February 17, 1996. . . . Convinced that the call to the presidency was from God, he, typically with great humility, thought of the institution first. As our culture places new challenges before the church, a marriage of clarity of mind, integrity of confession, and charity of heart will hold the Gospel before our age in all its brilliance. 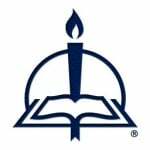 The seminary, under God’s grace, can form pastors who will integrate an un­swerving commitment to the Triune God with sterling care for God’s people. His installation as president was on April 28, 1996. He guided the seminary to its first ever ten-year accreditation from both the Association of Theological Schools and the Higher Learning Commission of the North Central Association, the highest level of accreditation achievable. His compassion found concrete expression in the establishment of the Deaconess Program in 2003. Finally, under Dr. Wenthe’s leadership, the seminary, after more than thirty years of on again/off again planning, successfully began expansion of its library facilities, creating a structure that can only be described as world class. Dr. Wenthe retired from the presidency on June 5, 2011. How­ever, that has not stifled his creative and energetic service. In ad­dition to returning to the classroom and continuing work on his Jeremiah commentary, he was most recently named interim president of the Concordia University System, which oversees the ten colleges and universities operating under the auspices of the LCMS. One thing that has always characterized Dr. Wenthe is his en­gaging, encouraging personality. From the time I was a student at this seminary, agonizing over sermon preparation, to discussing “future possibilities” with him following his election to the pres­idency of CTS in the spring of 1996, to serving with him in sem­inary admin­istration, he has con­sistently held forth a gracious, Christ-centered vision for this institution and encouraged his colleagues in the same. . . .
For his more than forty years of service to this seminary, fifteen of which were spent as president of Concordia Theological Seminary, we can only give thanks to God, especially for Dr. Wenthe’s col­legiality and the way in which he has embodied the CTS mission to form servants in Jesus Christ who teach the faithful, reach the lost, and care for all. From The Restoration of Creation in Christ © 2014 Concordia Publishing House, www.cph.org. Contact CPH for permission to reproduce this material. The complete text of this biography, including annotations not included here, is available in The Restoration of Creation in Christ.